Over the years I have undertaken commissions to recycle diamonds into new jewellery, keeping the family connection while housing the stone in a piece that fits the character of its new owner. My clients came to me with a large 1.85ct diamond set into a very typical, Victorian bar brooch which wasn’t my clients style. I noticed that the diamond was an Old Mine Cut, a shape that dates back to the 1830’s, being common until the turn of the 19th century. They are deeper than modern cuts and tend to follow the natural shape of the rough diamond so that as little as possible was cut away, hence the cushion-like shape. Old Mine Cuts also have a different facet arrangement that produces a much ‘softer’ cut than the ‘crushed ice’ appearance of modern, machine cut diamonds and, consequently, this stone had a beautifully soft glimmer to it. The history of the diamond was of particular interest to my clients as they can place their grandparents in South Africa, near the Kimberley Mines, during the mid 19th Century. This is, perhaps, how it found its way into their family. 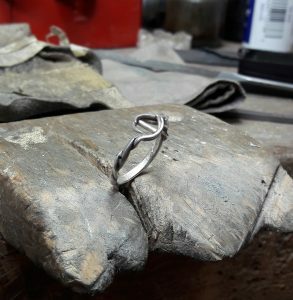 My clients wanted to incorporate the diamond into a ring that would mark the new-found freedom of retirement from the teaching profession. 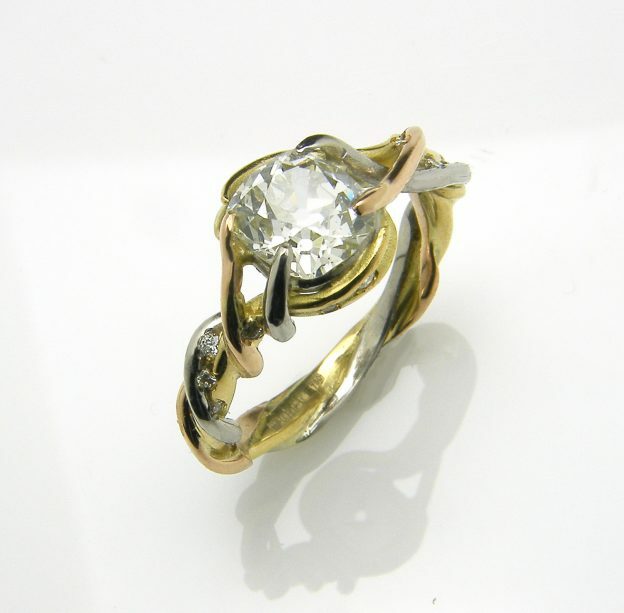 The gentle gleam of the stone lent itself to an organic design and, working with the theme of wisteria tendrils, I wound together coloured gold and palladium to form a band for the ring and enclose the diamond. 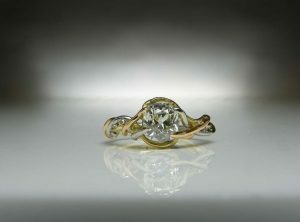 Recycling the yellow gold from the original Victorian bar brooch into the ring continues the family connection, and scattering a number of tiny diamonds among the tendrils, like raindrops on vines, adds a little sparkle. 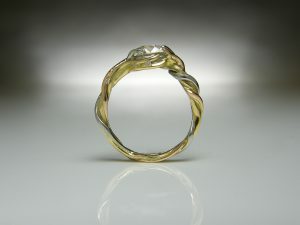 The lightness of the entwined wires makes the ring deceptively delicate, given that it holds such a large stone. 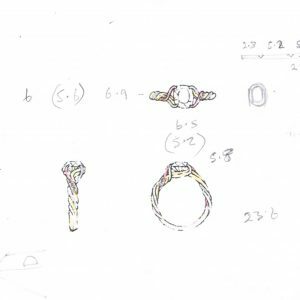 Following the wishes of the client, this was a deliberate choice to reduce the impact of the diamond, producing a piece that can comfortably be worn everyday without being too ostentatious. My client commented that “our little sparkling beauty has clearly slept its way from my grandmother to my wife and will now continue onwards in the family…. it will be worn and worn, and loved so much” – a perfect result!